Winter Storm Warnings and Advisories in Effect! National Weather Service (NWS) is predicting 3 to 6 inches of snow and sleet with snowfall rates of up to 1” in the morning. Reduced visibilities and snow/ice covered roadways will create difficult travel for morning and evening commute. 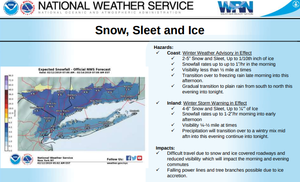 Below is the NWS summary of the expected weather today, Tuesday, February 12.  Precipitation transitions to a wintry mix during the late morning into afternoon hours from south to north. There is some uncertainty with how quickly this transition occurs. Small timing differences will have significant impacts on snowfall and ice totals.  Snow and sleet totals of 2-5 inches along the coast and 4-6 inches inland, before the changeover.  Ice Accumulations of up to ¼ inch across Interior and 1/10th inch along the coast.